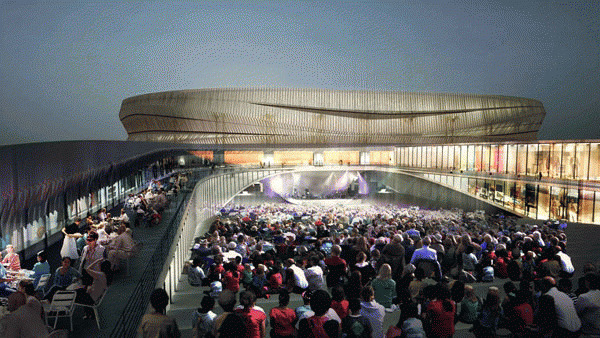 The future of Long Island’s venerable Nassau Coliseum now lies in the hands of the county. Before them are four very different visions for the space, from complete teardown and rebuild to a simple light renovation. But before the decision comes down, affecting the entertainment options for generations of Long Islanders to come, we wanted to get your opinion. Below you’ll find a brief rundown on each plan and what it entails. 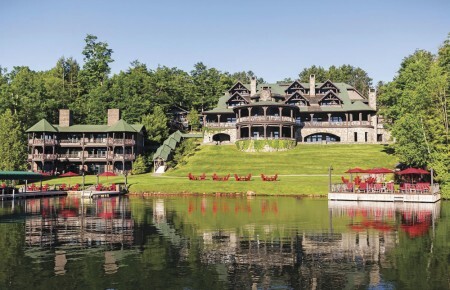 Take a look over the basic facts, then vote for your favorite. If you’d like, you can leave a comment as well. The most visible change in the $229 million renovation would be a new façade to the coliseum, replacing the solid mass of concrete around the exterior with an intricate wrap of folded metal fans that, “…evokes Long Island’s iconographic imagery, such as beach dunes, dune fencing, decks, and boardwalks.” This plan would also add a 2,500-seat amphitheater for concerts, films and other summertime entertainment options, surrounded by 50,000 feet of retail space. But the real appeal of this plan lies in the muscle behind it, with several of the companies involved having recently enjoyed huge success with Barclays Center, including Forest City Ratner Companies and SHoP Architects. Factor in partner Roc Nation’s lineup of musical acts (Jay-Z himself appeared at the presentation of the plan to county advisors) and you have some star power behind the NEC plan. Seating: 13,000, plus an approximately 2,000-seat theater, a movie theater, and an approximately 2,500-seat outdoor amphitheater. Entertainment: Live Nation and Roc Nation musical acts, plus 6 Islanders games per year, 1 Nets preseason game and minor league hockey. The payoff: An estimated 10.9 billion in economic activity over 30 years. The Madison Square Garden Company follows a formula for success they’ve utilized at similar properties in Baltimore and Philadelphia with their plan for Nassau Coliseum. 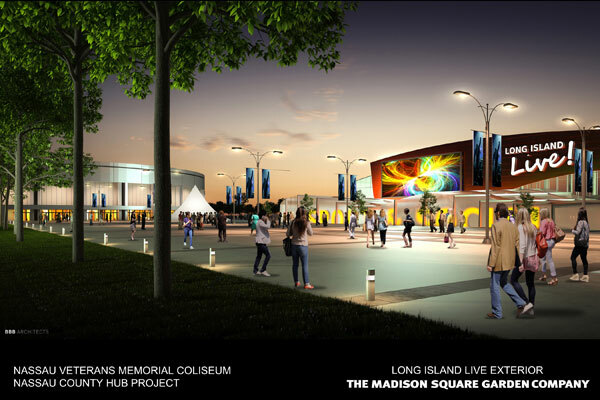 Besides a $250 million upfront investment, which would reconfigure the coliseum so it could easily transition from 14,500 seats to 1,700 seats depending on need, the MSG plan would create a nearby entertainment complex called Long Island Live! This five-acre entertainment district would combine restaurants, clubs, sports bars and an MSG Sports Zone. The only plan to include a complete teardown, the Blumenfeld Development Group’s proposal envisions a $180 million project that would see a 9,000-12,000 seat arena in place of the current Coliseum. 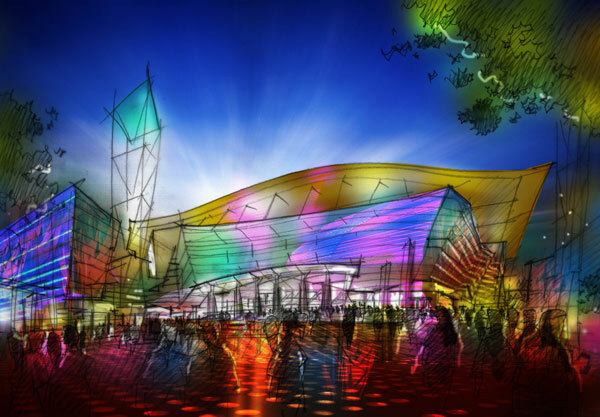 The plan would also add a 100,000 square foot convention center to the premises, new retail entertainment space and a residential component geared at turning the Coliseum and surrounding area in a 24-hour vibrant community. In addition, BMG plans on using the redeveloped Coliseum site to provide a venue for Hofstra’s sports teams as well as a variety of entertainment, dining and retail options to create a downtown for its students and faculty. Entertainment: Minor league hockey, plans for Big 10 basketball. Former hockey player and Bayville entrepreneur Bernard Shereck’s New York Sports & Entertainment, LLC put forth plans for the coliseum that could be seen as the minimalist plan for the space. Rather than a complete teardown or a transformation into a massive entertainment complex, the NYS&E plan calls for a simple downsizing of the existing arena from more than 18,000 seats to 8,000-10,000 using $60 million in private funds. The group counts Global Spectrum among its partners, a group that brings no small amount of event management experience to the table. They plan to stage more than 170 events annually. A statement from NYS&E claims they have received letters of intent from the National Lacrosse League and East Coast Hockey Leagues to start franchises at the Coliseum and that discussions with the Canadian Women’s Professional Hockey League are ongoing. They also plan on donating part of the coliseum’s marketing income to various veterans organizations. Entertainment: Minor league hockey, lacrosse, plus possibilities for women’s basketball and ice theatre.